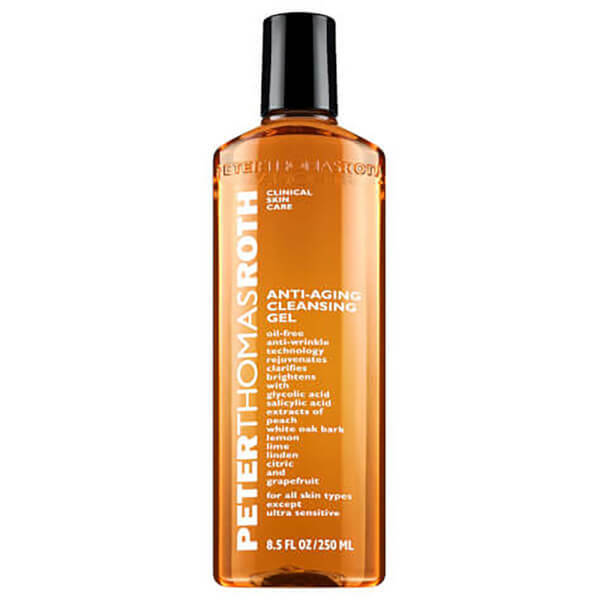 This Luxurious, anti-ageing facial cleansing gel provides an exhilarating, peachy clean freshness to help produce a beautiful, fresh, youthful-looking complexion.An advanced deep pore resurfacing action increases cell turnover to help diminish the appearance of fine lines, wrinkles and other signs of aging. Ideal for all skin types, except sensitive. It effectively detoxifies the pores, emulsifies oil and improves skin texture as it gently sweeps away dead skin cells and impurities that can dull the complexion. Glycolic and salicylic acids and brightening botanicals exfoliate and clarify the skin, leaving it ultra clean, refined and revitalised. Glycolic Acid exfoliates dead skin cells. Salicylic Acid helps to loosen oil within the pores and prevents future breakouts. Panthenol moisturizes, nourishes, and clarifies. Lemon, Lime, and Grapefruit Extracts brighten. Water, Ammonium Lauryl Sulfate, Cocamidopropyl Betaine, Peach (Prunus Persica) Extract, White Oak Bark (Quercus Alba) Extract, Lemon (Citrus Medica Limonum) Extract, Lime (Citrus Aurantifola) Extract, Linden (Tilia Cordata) Extract, Grapefruit (Citrus Grandis) Extract, Glycolic Acid, Arginine, Citric Acid, Citrus Bioflavonoids, Salicylic Acid (Beta Hydroxy Acid, Propylene Glycol, Diazolidinyl Urea, Methylparaben, Propylparaben, Sodium Chloride, Yellow #5 (CI19140), Yellow #10 (CI47005).